Police in New York are investigating claims a senior officer told members of his team to “shoot” the rapper 50 Cent. It’s alleged Deputy Inspector Emanuel Gonzalez made the remark in June last year at a police roll-call for a boxing match which the star was due to attend. 50 Cent said on Sunday he was taking the threat “very seriously” and was consulting with his lawyers. The New York Police Department told Radio 1 Newsbeat the matter “is under internal review”. The New York Daily News reported that Deputy Inspector Gonzalez told his officers to shoot the rapper “on sight” but later tried to pass it off as a joke. It’s claimed at least one other person at the event reported the comment to the NYPD internal affairs department. One month before, Dect Insp Gonzalez reportedly filed an aggravated harassment complaint against 50 Cent. 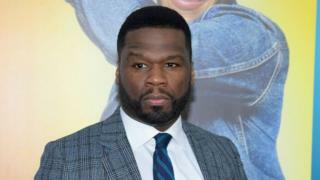 He said the rapper had threatened him on Instagram – in response to claims that Dect Insp Gonzalez had unfairly investigated one of 50 Cent’s favourite nightclubs. 50 mocked the complaint in posts online, suggesting the police get “back to fighting crime”. Writing on social media following news of the internal NYPD investigation into Dect Insp Gonzalez, 50 Cent said he was concerned that he was “not previously advised of this threat by the NYPD”. He described Dept Insp Gonzalez as as a “gangster with a badge” but told his Twitter followers: “Keep in mind there are some good people working in law enforcement.